Negotiations with our teacher's union, the Southwest Teachers Association (SWTA) began in April 2015. The negotiating teams met ten times, and were unable to reach agreement. On January 27, 2016, the District declared Impasse, which signified that the negotiations process was stalled, and allowed for a state-appointed mediator to work with both the District and SWTA toward a mutually agreeable settlement. The mediator met with us for the first time on March 3, 2016. Typically, mediation requires multiple sessions, and the process can be lengthy or quick, depending on the issues at hand. Our next mediation session is scheduled for April 8, 2016. Wages. Last year, all employees received a 4% salary increase. Prior to mediation, the District made four different proposals, including a 3.5% salary increase and additional steps on the teacher's salary schedule. This proposal would increase the maximum SBUSD certificated teacher salary, with these steps, to $93,865 from the current $86,579. This represents a significant increase in lifetime and retirement earnings. In addition to salary, employee compensation also includes health benefits. Presently, the District pays benefits worth $12,000 per eligible staff member. On the proposed revised salary schedule, total compensation (salary and benefits) for a beginning teacher would be $54,753,an average salary would be $89,768, and the highest certificated teacher step would be $105,865. Prior to mediation, SWTA had made no movement since their initial wage proposal of an 8% salary increase, an ongoing cost impact that is simply not available or sustainable at this time particularly with the additional requests. Certificated staff/teachers are placed on a salary schedule, based on a variety of criteria including education and days/years of service, among others. Teacher's salaries are annually adjusted as they move down the steps and across the columns of the salary schedule. Nearly half of our certificated employees routinely receive these increases that range between2.1%-4.5%, in addition to negotiated salary increases (as articulated in the paragraph above, the 4% and 3.5%). Class Size. Our current agreement with SWTA requires the average TK-3 classroom to be 25 students to one teacher (25:1) and the average 4-8 classroom to be 32:1. Funds from the state are being increasingly allocated with a goal in the year 2020 for TK-3 class averages to be 24:1. Currently the average class size for Transitional Kindergarten through third grade students in SBUSD is even lower than the SWTA agreement and the state target - at 23.8. The average for students in grades four through six is 30.5 and 31.3 for grades seven and eight. There are no state target for these grade levels. State funds for class size reduction cannot be used for salaries. Other. SWTA has also made proposals related to increased counseling support, Nurse staffing, and structured planning/preparation time for teachers. Counseling Support: This year the District hired three new School Psychologists for a total of 13 for our 12 schools. Adding three additional psychologists allowed us to provide approximately one NEW day each week of support to every school. This support is required to be for individual and small group counseling for both students and families. Nurse staff: South Bay currently funds five full-time Nurses. The nurse to student ratio is well below the nurse to student ratio of our neighboring districts. In addition, the District also employs a Licensed Vocational Nurse (LVN) and a Health Clerk to support our Nursing team. Planning time: While the teams are not far apart in their proposals for teachers to have unstructured personal planning time during their work day, the District must balance this request for increased time with the needs for collaborative planning. Our goal is to keep you informed throughout this difficult period. We will provide ongoing updates on our website and have devoted a page dedicated to negotiations on our Website (www.sbusd.org). I welcome your questions and comments and share your commitment to our children's education. If you have any questions, please do not hesitate to call your school principal or my office. I can be reached by email atkmcnamara@sbusd.org or by phone at (619) 628-1605. Thank you for your patience during this time. 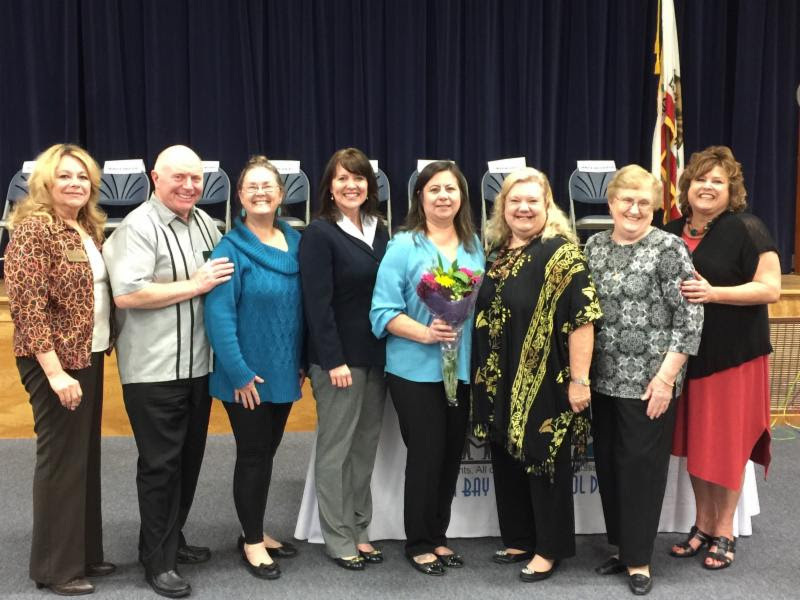 Extra congratulations to Margie Cordero who was selected the 2016 District Classified Employee of the Year! Creating a positive school culture is of great importance at Imperial Beach Charter School and we continue to take a proactive stance to ensure our students are coming to school every day feeling safe, welcomed, and valued. Uniting us in our continued efforts is PBIS, our Positive Behavior and Interventions Support systematic approach, which grounds us in best proactive practices. Step onto either of our campuses and you'll readily notice an overall respectful, responsible, safe, and kind environment where students are encouraged to smile and greet others as they pass, where students are acknowledged for acts of kindness towards their fellow peers, where students demonstrate school pride by keeping hallways, lunch areas, and restrooms tidy, and where all staff members respectfully communicate clear expectations throughout each and every day. 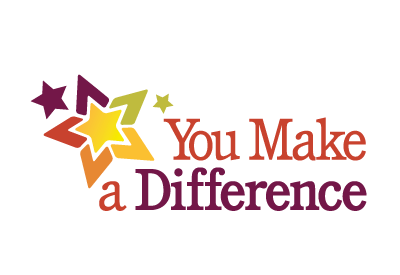 Every staff member, every student, and every community member who walks our hallways plays a vital role in this positive culture we are so proud of and have worked so diligently to create. Everyone knows what it means to be Respectful, Responsible, Safe, and Kind while in the classroom and throughout the campus. IB Charter recognizes the correlations between student achievement and fostering a positive school culture and climate and will continue utilizing PBIS to ensure the needs of the whole child, the needs of every child, continue to be met while in our care. 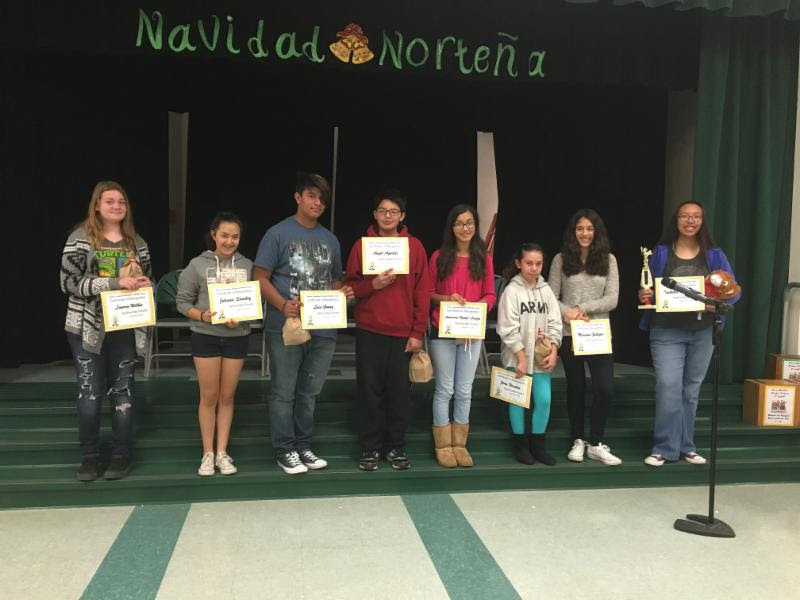 Nestor Language Academy Charter recently held its First Annual Spelling Bee. All middle school students participated in several rounds of spelling in order to narrow down the list of contestants to 8 finalists who would then go on to compete for the title of Nestor Language Academy Spelling Bee Champion. The last round of spelling took place on Thursday February 11 in the school cafeteria. It was a full house and you could feel the excitement in the air as the eight finalists walked onto the stage. Trustee Barbara Elliot-Sanders looked on with anticipation and wonder as students approached the podium to spell words such as Paragon, Zealous, and Udon. The final moments of this event caused great enthusiasm and eagerness. Principal Lupita Avilez officiated the event and was proud of all of the students, "What an amazing effort on behalf of both teachers and students... next year it will only get better!" Congratulations to the Finalists: Lauren Wilkie, Sophia Raya, Angel Aguilar, Mariana Gallegos, Juliana Sanchez, Amairany Nuñez Loaiza, and Luis Carlo Gomez Moreno. 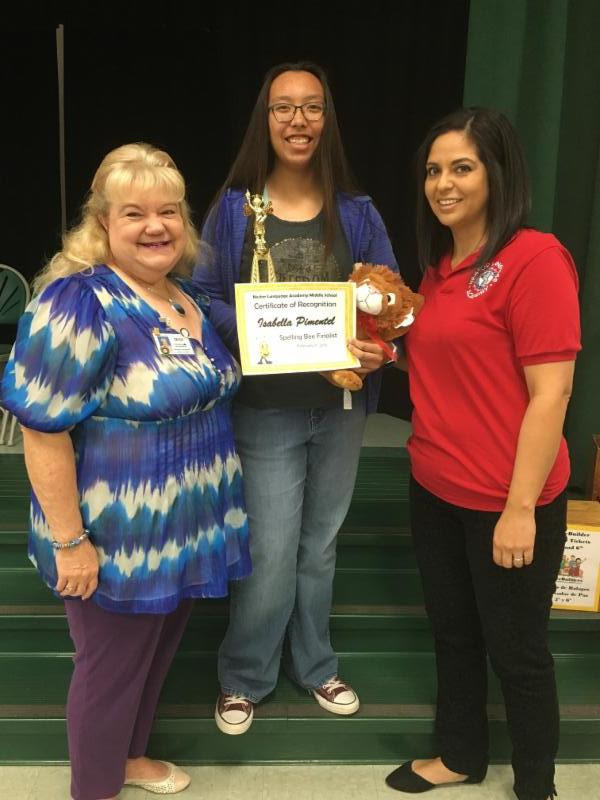 Special congratulations to Isabella Pimentel who was named School Champion. 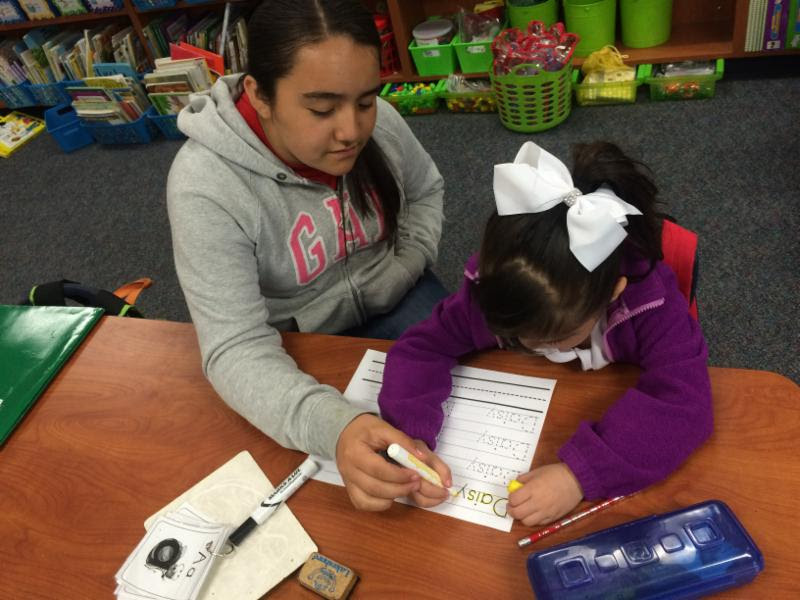 PALS (Peers Achieving Leadership Skills) is an extracurricular club whose primary focus is community service. The mission of this group is to foster civic responsibility and altruism through student-initiated projects and activities. In its inaugural year, a partnership between the sixth grade and TK-Kindergarten teachers was established to facilitate peer mentorship between the students. Through this work, the sixth grade volunteers gained leadership skills, including communication, conflict-resolution, commitment, and responsibility, as well as valuable life skills like self-esteem, confidence, and the ability to foster positive relationships. At the same time, the Kindergarten students also improved on their social skills. 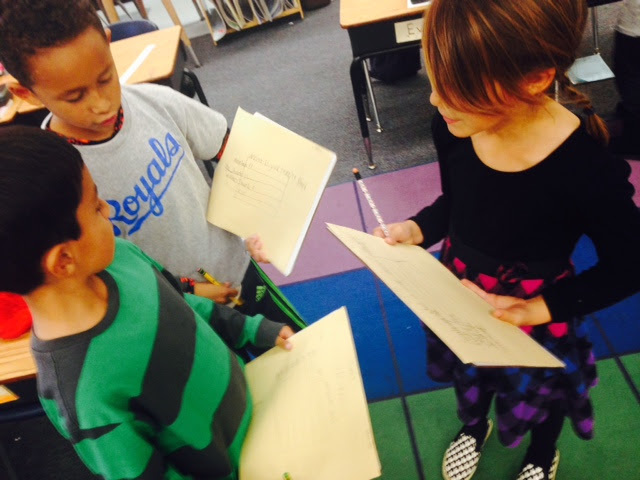 They learned to verbalize ideas, cooperate, collaborate, and appreciate others. In the future, Nicoloff plans to expand the focus from volunteering at the classroom and school level, to participating in neighborhood and community events and/or planning community outreach activities. 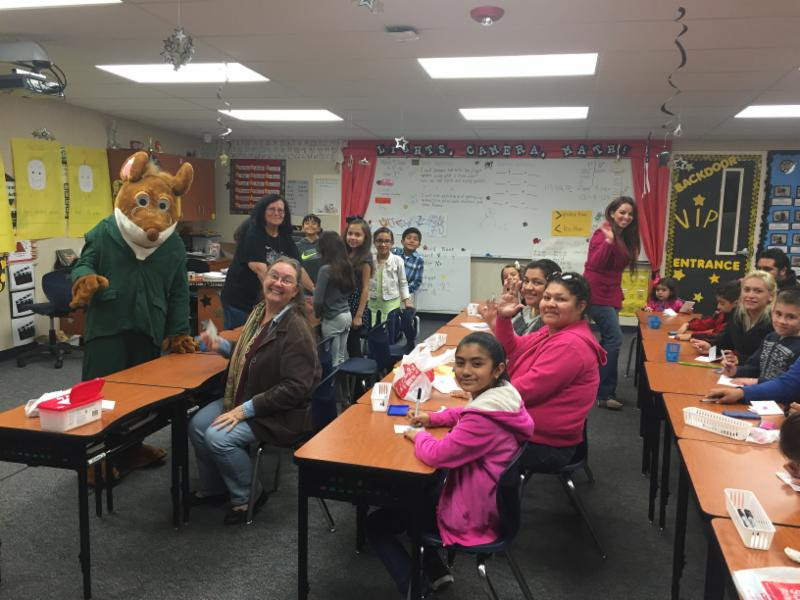 Sunnyslope school held its 2nd Annual Family Literacy Night on March 9. 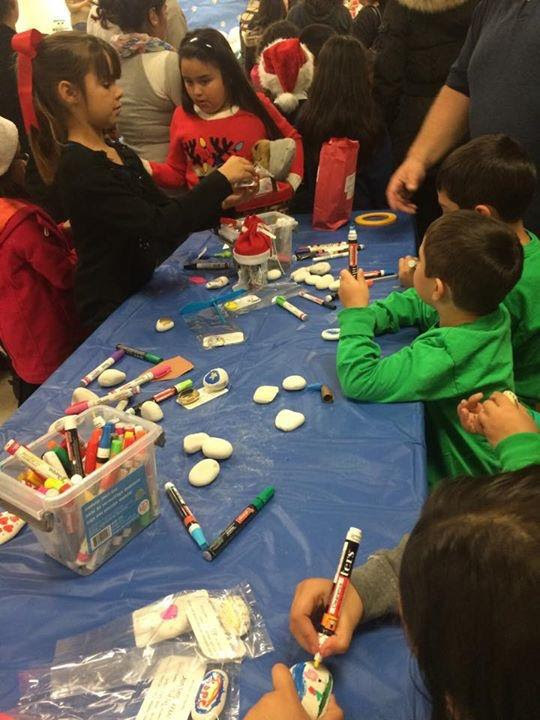 Families participated in various literacy activities that encourage creativity, the development of the whole child and quality time to connect as a family. 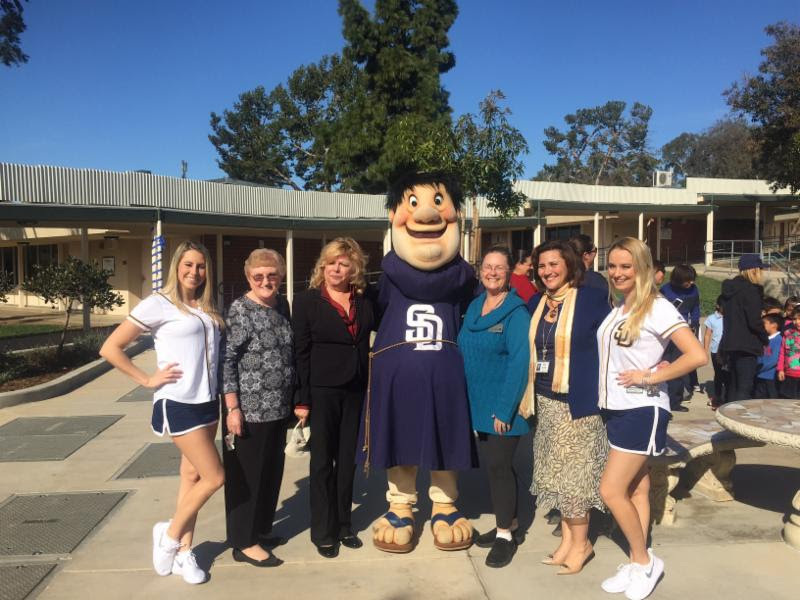 Sunnyslope School and the San Diego Padres begin a new partnership to promote and encourage outstanding attendance to support student achievement. Sunnyslope students and families support the Jose Montano Foundation and give from the heart by making "Rocks of Hope" that get delivered to hospitals where children are battling cancer. We are happy to announce that in the Roadeo competition, two of our teams placed 1st & 3rd of all competitors. Congratulations to our winners! On February 6, the California Association of School Transportation Officials (CASTO) Chapter 3 (San Diego) held their annual Special Needs School Bus Workshop and Roadeo. Fifteen SBUSD Transportation Staff attended this event. 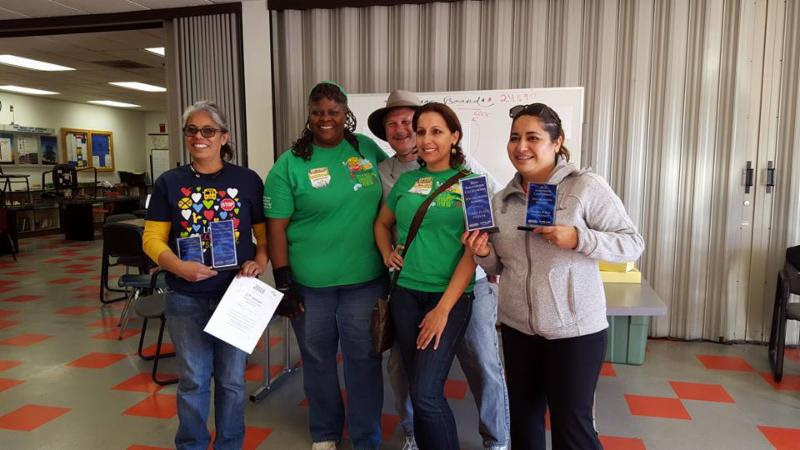 While 11 of our bus drivers and attendants learned about various subjects related to special needs transportation, four of our drivers participated in the skills building/competition of the Roadeo: Nydia Pichardo, Troy Owens, Sharon Escalera, and Irma Tudara. The teams consisted of two school bus drivers, one as a driver and one as an attendant. Teams were allowed to go a second time switching places (one pair was two different teams). Working together to complete the events was key to their success. Each event had minimal amount of space and time to complete. For instance, when the drivers entered parallel parking, they had two minutes and six feet of excess room to work with. 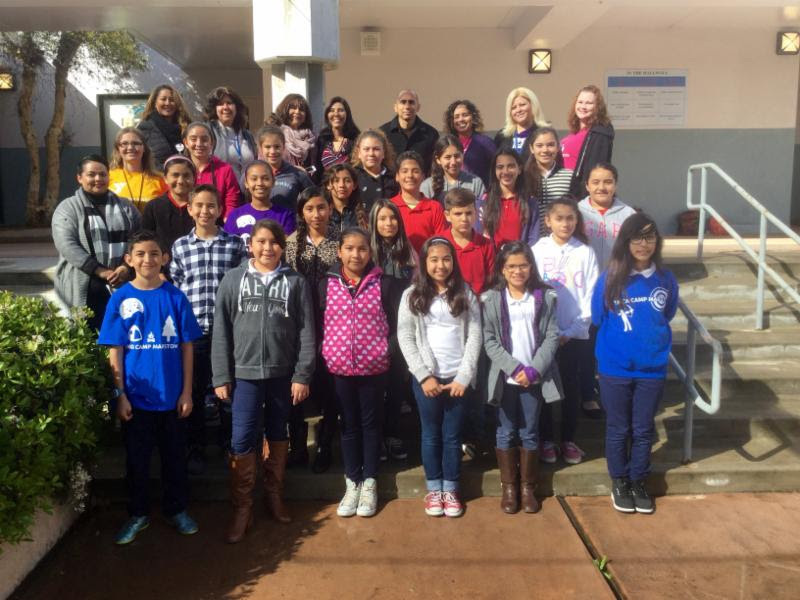 The SBUSD Education Foundationis a non-profit 501 (c) 3 corporation organized and operated for the benefit of the students of the South Bay Union School District. The Board of Directors is comprised of parents, educators, and community leaders who volunteer their time, energy, and knowledge. The Foundation provides you with a way to support excellence in our schools on a tax-deductible basis. You can do this by making direct contributions, memorials, gifts, or by attending/and or helping with our events. The Foundation is hosting the Stars under the Stars event on April 16. For more information, please visit the Foundation website. The South Bay PTA Councilwill sponsor the SBUSD Unity Games/Field Day event on Saturday, May 21, from 9:00-12:00 at Mar Vista High School. The event will include sporting competitions, food, music, and resources for families. Please check with your school on details. In the past several weeks the Maintenance and Facilities Department has been working on several projects that will benefit the students of South Bay Union School District. In January, we completed the installation of brand new playground equipment and rubber surfacing at Nestor Language Academy. 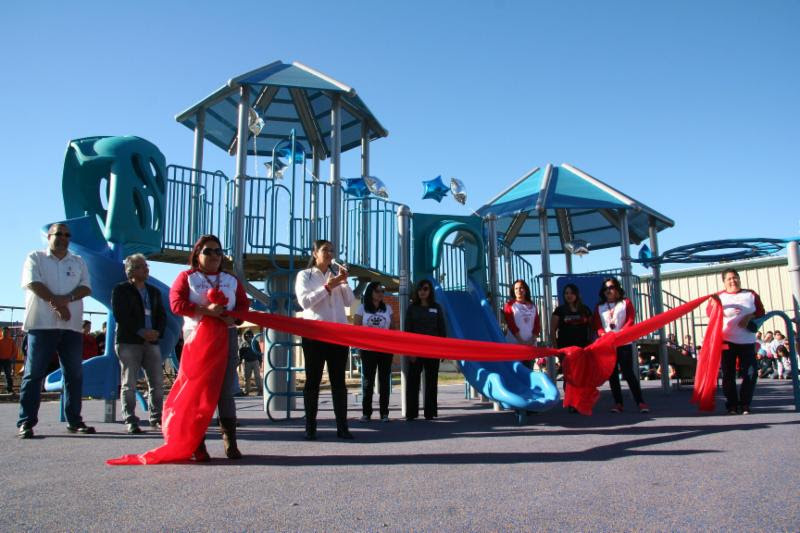 We were invited by the Nestor PTA to the Ribbon Cutting ceremony on January 26. It was great to see the students enjoying their new playground. 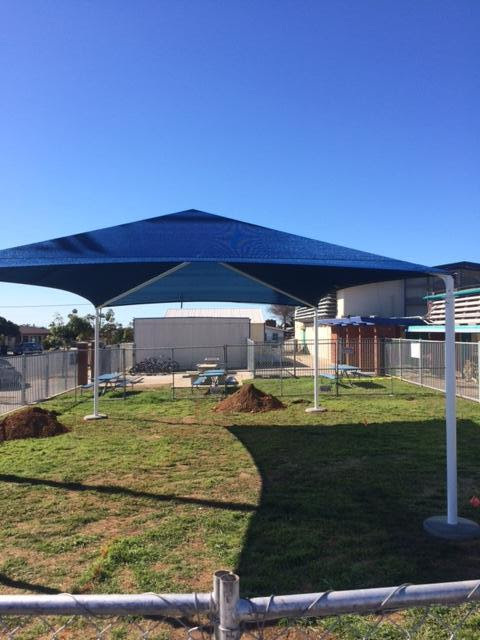 In February, the team completed the installation of eight new shade structures at seven schools to provide much needed shade for students and parents on hot days. In the coming months, we will be installing three digital LED marquees at Imperial Beach Charter, Oneonta and Bayside Schools. Do you know about the Family Resource Center located on the campus of Central School? The Center offers community services and access to numerous resources for District families. Visit their website for more information. The 13th Annual Magkaisa Filipino-American Student & Parent Conference is on Saturday, April 16 from 8:00-2:30 at San Ysidro High School. See theflyer for additional details.